The High Speed Stretcher extends a variety of dough without the loss of elasticity, enabling superior and high quality bread. The New High Speed Stretcher Condenses Rheon's Principles of Stretching into a Useful, Flexible, and Compact Body. 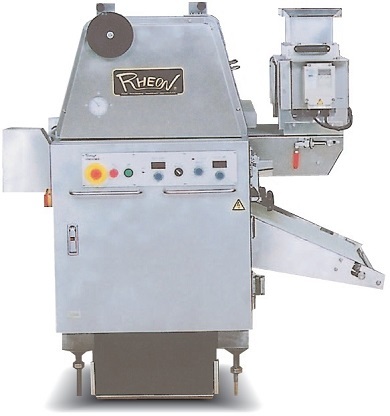 Rheon's STRESS FREE(R) method applies only negative stress during stretching, so that no shearing stress arises within the dough from different internal speeds. Rheon uses continuous and minute vibrations that trigger a thixotropic reaction within the dough, and stretching occurs without stress. 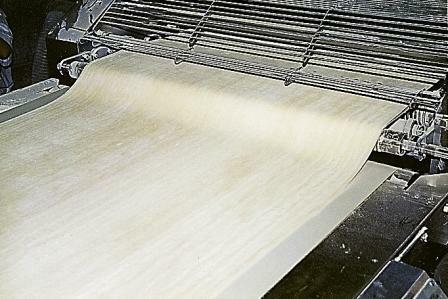 Compare the STRESS FREE(R) results with those of conventional and high stress sheeting machines : the difference is apparent in the quality of the baked products. It scales down the entire production line for space efficient production. 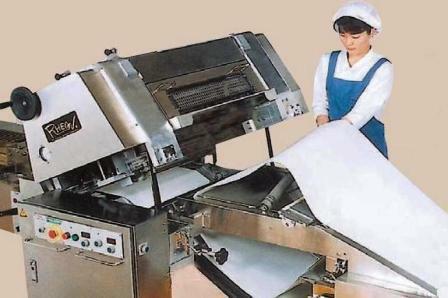 It extends a variety of dough by controlling production conditions as desired. Make adjustments at anytime, to adapt to the stretching ratio and processing speed. Choose the PMU option for fully automated control of stretching and operating speed. Dusting flour does not scatter, to maintain sanitary conditions at all times. Hygiene-conscious design facilitates cleaning and maintenance work. Simple one-touch parts disassembly and assembly. Easy access to corners inside the machine. Designed for a safe and hygienic production environment with no contamination and dusting flour accumulation.